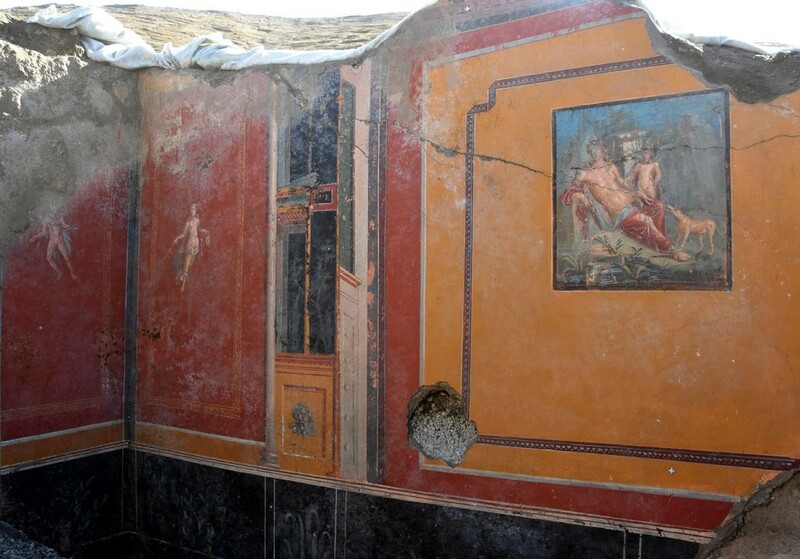 The fresco probably dated to “the last years of the colony,” Massimo Osanna, the site’s director general, said, citing the “extraordinary preservation” of the image’s colors. In the fresco, Narcissus reclines by a pool, his face damaged but looking downward toward the water, where his greenish reflection stares back. A winged figure who may be Eros, the Greek god of love, stands nearby, as does a dog — tugging in vain at Narcissus’ garment, unable to pull him away. Mr. Osanna said that the decorations around the room were “pervaded by the theme of the joy of living, of beauty and of vanity.” Other mythological figures, like cupids, maenads and satyrs, also appeared in the public part of the house “as though part of a Dionysian retinue,” he said, referring to the Greek god of wine and revelry. In the atrium where the Narcissus fresco stands, the archaeologists also found the trace of stairs leading to an upper floor and the remains of glass containers, a bronze funnel and eight amphorae, the ancient vessels for olive oil, wine or other goods. Ms. Russo said the team hopes to open “at least part” of the home to the public. The opulence of the home suggested it was “a grand residence with a wealthy owner,” said Sophie Hay, an archaeologist at the University of Cambridge who has studied Pompeii and was not part of the excavation.Around the beginning of the millennium, Dr. Hay said, Greek myths were made popular by the poet Ovid. “In Pompeii it became fashionable to depict the myths in frescoes,” she said. In Ovid’s telling of Narcissus, he is a preternaturally handsome young man who is predicted to live a long life so long as he never catches sight of himself. A nymph named Echo falls in love with him — and Narcissus rejects her. She retreats to a cave, eventually fading to only a voice. The excavations are in a part of Pompeii at the edge of the site and vulnerable to collapse, which threatens the archaeological artifacts below, Dr. Hay said. The unearthed fresco follows several other recent finds at Pompeii, including a horse covered in pumice and ash, an elaborate shrine embedded in a wall, and the skeleton of a man who seemed to have been crushed by a flying boulder, but probably was not..